The Slickrock Basin to the Flatiron and on up to the 5024 Summit in Arizona’s Superstition Mountains is a badge proudly worn. The Flatiron, a massive rock formation located on the westernmost end of Superstition Mountain, is the result of volcanic activity some thirty million years ago. The mountain rose thousands of feet above the desert thanks to rocks and magma deposited from nearby volcanic eruptions. As eruptions subsided, the caldera that once fed the activity, emptied leaving a huge subterranean cavern that could no longer support the weight of the mountain above. As the cavern collapsed, the entire mountain disappeared into the, then extinct, caldera. As time passed, more subterranean activity, perhaps volcanic or plate tectonics, forced the mountain to rise from its grave. The extreme forces exerted upon the rocks left the sheer cliffs exposed as the mountain, much like the legendary Phoenix of old, once again grew from the ashes, leaving a rugged mountain range etched with deep canyons and sheer vertical cliffs. Many more eons of wind and rain have eroded the mountain to its present day form. * Come prepared for a muscle burning experience. * Bring along sufficient amounts of water and snacks. * Good quality footwear is very important on the polished slickrock surfaces that will be encountered. * This is a designated Wilderness Area so directional signs and painted markings on the rocks are illegal, it's up to you to know the route and utilize good trail-finding abilities. Today the mountain is a magnet, attracting hikers from across Arizona, the US and even foreign nations to challenge the steep rugged trail leading from the Saguaro studded desert foothills to the summit at 5024 feet above sea level. Access to this massive rock formation is via the Siphon Draw Trail and is a challenge to a person’s strength and stamina to hike and climb the three mile trail that gains more than three thousand, feet in altitude. Locals consider the Flatiron a worthy adversary as they train for hiking the trails of the Grand Canyon. Siphon Draw Trail has its beginnings just outside the Lost Dutchman State Park off the Apache Trail about five miles East of Apache Junction, AZ. The desert is approximately two thousand feet above sea level and supports stands of Giant Saguaro Cactus and several species of desert wildflowers. 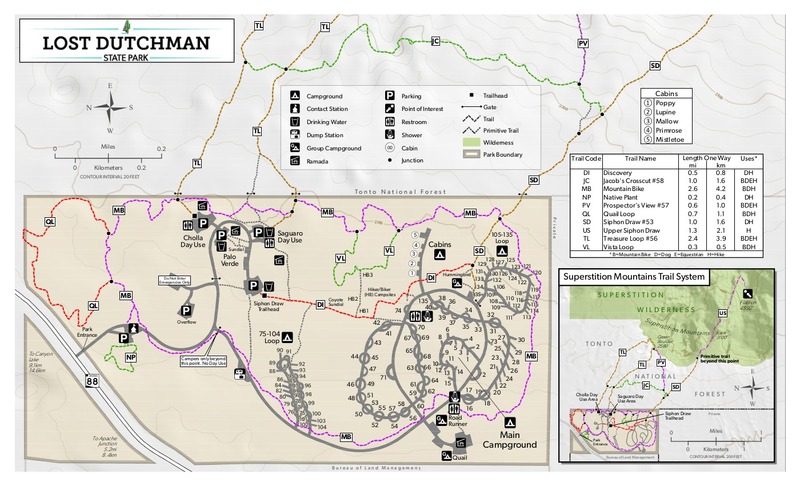 The trail is wide, gently sloping and well groomed, with spectacular views of Superstition Mountain lying a short distance ahead and walking the trail is relatively easy. In the hours of pre-dawn and early evening, small herds of Whitetail and Mule Deer can be seen browsing for bits of grass not too far off the trail, while keeping a watchful eye for the ever-present Coyote lingering close by. Enjoy the experience while you can, because soon the trail becomes steeper and large rocks dot the trail as it weaves around boulders and curves in and out along the edge of the normally dry Siphon Draw wash. As the mountain gets closer, the rocks give way to boulders and the slope becomes steeper, the footing becomes tenuous as the rocky trail turns into a path with a base of what the locals refer to as “Slickrock”. After about one and three quarter miles, you will arrive at the “Basin” which can be easily identified by the presence of a usually dry waterfall and an extremely steep one hundred plus yard stretch of that polished slickrock leading up to a narrow gap between solid rock canyon walls. On a busy weekend, the large basin area usually has several hikers, both male and female, of all ages milling around the base of the steep slickrock slope, polished following thousands of years of water borne sand and stone. It’s decision time now, do you continue on up the remaining three quarters of a mile with one thousand, five hundred vertical feet yet to go or do you admit that you enjoyed the experience and turn around. 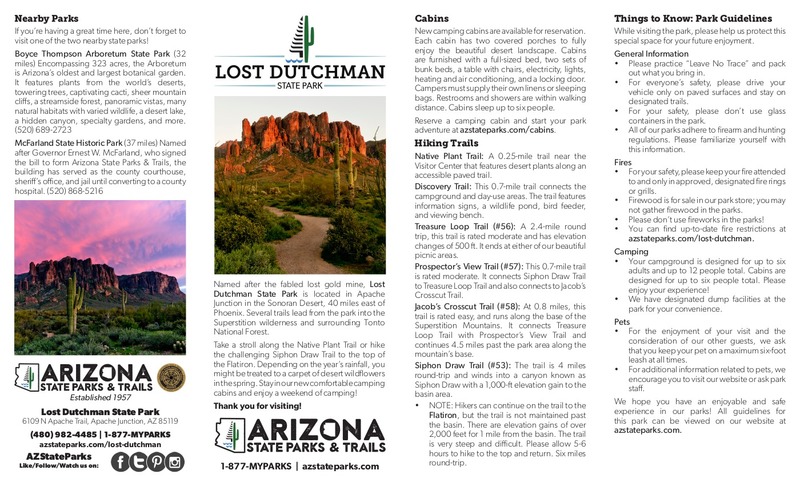 Most first timers to the Siphon Draw Trail are overwhelmed by the sights surrounding them, some of the rock walls are dotted with small alcoves that can resemble faces of gargoyle-like figures, the seemingly insurmountable slickrock and far above them are the sheer vertical cliffs of the Flatiron. Those who have decided to proceed, will scramble up the smooth slickrock and work their way through the narrow slot at the top, only to be confronted with a view of the remaining trail leading, to what appears to be, a near vertical climb through rocky, hell-like corridors with growths of Catsclaw brush, studded with occasional Agave, Prickly Pear and Cholla Cactus plants. Another culling of adventurers takes place here, while only a more determined hiker continues on, and no, you haven’t reached the hard part yet. From here on, the hiker now changes style and becomes a climber, it’s going to require using your hands almost as much as your feet to overcome the natural barriers that the mountain has placed in your path. Sections of near-vertical rock walls must be scaled, many appear to have alternate trails leading around them, but beware of false trails that can lead you up only more dangerous paths, well away from the main trail. The mountain has intentionally placed obstacles in your way, almost as though it was trying to keep mankind from reaching its scenic summits, so as each is encountered, it must be evaluated and overcome, only to be confronted by the next one and the one after that. The climb is so steep that you still cannot see the top of the trail, but you know it can’t be too far now as the steep cliffs of the Flatiron are almost at your right side, and then it happens. You find yourself on a four foot deep by twelve foot wide dirt and rock shelf, looking directly into the face of a ten foot tall wall studded with irregularly placed sloping rocks sticking from it. This is known only as “The Wall”. Although this is the last of the hurdles, and the top of the trail is only a stone’s throw away, some hikers are so intimidated by the wall that they surrender to the mountain and began their return, back down the mountain. The left side of the wall has the remains of a small Mesquite tree growing near the top while the right side has a sharp corner that may provide hand and footholds and the center, well the center of the wall has only sharp-edge rocks protruding from it that all seem to be slanted downward. Ropes and/or cables cannot be permanently installed as this is part of the Superstition Mountain Wilderness Area, and are prohibited, so you must make do with what you see. When you have finally overcome the wall, it’s a short, but steep, scramble to the saddle where you will find trails leading to the Flatiron, Ridgeline Trail, the air crash memorial or the 5024 summit. Most hikers will follow the well worn trails out onto the gradual slopes of the Flatiron, take a well deserved break, take in the scenic views and prepare for their return trip back down. The more adventurous hikers, however, will seek out the trails heading up into the foreboding maze of Hoodoos that guard the Western summit, 5024. Once again, be careful which trail you choose to follow, as many are false trails that have a sudden, vertical dead end. If you have found the right trail, you will have a very narrow slot to pass through requiring the removal of your backpack, there will be more boulders to scramble over and even a short tunnel to navigate around and through some fallen Hoodoos. You will know you’re at the summit as soon as you break out of the maze of rocks and into the sunshine. The rocks and boulders here have names inscribed on them from those who came ahead of you and the views from here are certain to exceed your expectations. Take your time to wander the summit, check out the scenery all around from every vantage point and be sure to take the obligatory photo of the Flatiron a scant 450 feet below and take in the views of the rest of the world three thousand feet below you and relish in the fact that you conquered the mountain and have arrived at the 5024 summit. Congratulations, take a break in the thin, clean air and get yourself psyched for the climb back down, it can be even more trying than the trip up. Do not gamble on finding water along the Siphon Draw Trail. Water may be present at the base of the waterfall and trickling through the "Basin" following a rain, but this is usually of poor quality. Some good camping sites can be found along the trail leading to the Ridgeline where you can expect to find some incredible late night views.